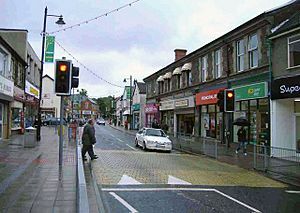 Blackwood (Welsh: Coed Duon) is a town and an electoral ward on the Sirhowy River in the South Wales Valleys administered as part of Caerphilly County Borough. It is located within the historic county of Monmouthshire. The town houses a growing number of light industrial and high-tech firms. Blackwood was founded in the early 19th century by local colliery owner John Hodder Moggridge, who lived at nearby Woodfield Park Estate: the first houses in Blackwood were built by Moggridge in an attempt to build a model village. Deplorable working conditions at the time of the Industrial Revolution, however, led to Blackwood becoming a centre of Chartist organisation in the 1830s. The South Wales Chartist leaders John Frost, Zephaniah Williams — a Blackwood man — and William Jones met regularly at the Coach & Horses public house in Blackwood. Planning their march on Newport in what became known as the Newport Rising in 1839, intended to coincide with a Britain-wide 'revolution' against the Government, the gentry and the Establishment in 1839. When the insurrection erupted in November a large contingent of insurgents gathered at Blackwood. Upon meeting their comrades from the upper Sirhowy Valley the rebels armed themselves with makeshift weapons and marched south to Newport to demand the adoption of the People's Charter and the release of Henry Vincent from Monmouth gaol. However, the South Wales Movement were the only ones to march and the national rising failed and its leaders were sentenced to death (later commuted to deportation to Tasmania). In 1912 the Titanic's distress signals were picked up by amateur wireless enthusiast Arthur (Artie) Moore who resided at the Old Mill, Gelligroes, just outside the town. Artie Moore went on to work as a senior scientist for Marconi and was involved with the invention of the transistor for telecommunications. The former Penllwyn House on the outskirts of the town was originally part of the Lord Tredegar Estates and is believed to be the original home of the family of Henry Morgan (c.1635-1688), a privateer and Governor of Jamaica. The building is now a public house The town is home to the Maes Manor Hotel, located in a grand old manor house known as Maesrudded. The house was formerly home to the Lord Lieutenant of Monmouthshire. Evan James (Ieuan ap Iago, 1809–93) was a weaver and wool merchant by profession and owner of the Ancient Druid Inn in Hollybush, in the parish of Bedwellty, Monmouthshire. He moved to Pontypridd when his son James (Iago ap Ieuan, 1833-1902) was a young boy. Evan James and his son James are credited with composing the Welsh national anthem, 'Hen Wlad fy Nhadau' ('Land of my Fathers') in 1856. Evan was a poet and it is believed that he wrote the words while his son James composed the tune. The song was published in the volume 'Gems of Welsh Melody' (1860) and soon became extremely popular. It is not certain when the song was first adopted as the Welsh national anthem. A memorial, designed by W. Goscombe John, was erected in honour of Evan and James James in Ynysangharad Park, Pontypridd, in 1930. The decline of the coal mining industry throughout the later part of the twentieth century affected South Wales, the major source of employment was lost and the pictorial landscape left daily reminders of what had been. State backed rejuvenation schemes have gone some way to rejuvenate the wider Blackwood area, including the relief road and various light industrial areas. In sport, Blackwood has two rugby union and one rugby league sides, all of whom play at Glan-Yr-Afon Park. The rugby union sides are Blackwood RFC, established in 1889, and Blackwood Stars RFC, originating circa 1920 . The rugby league club is called the Blackwood Bulldogs and plays in the Welsh Conference Premier. Rugby players Kevin Moseley, Alun Pask and Alun Lewis hail from the town. The Bus Station, which links Blackwood to a lot of surrounding areas and includes a rail-link service to nearby train stations, has had a make-over. Blackwood's cinema, the Maxime, was originally purpose-built as a cinema in 1938, was then used as a bingo hall, but is now once again a five-screen cinema. Some of the original decor has been preserved in the foyer. Blackwood is twinned with Protivín, a small town in the Czech Republic. 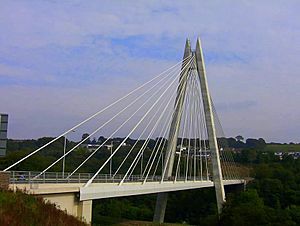 The Arup designed Chartist Bridge linking the East and West sides of the Sirhowy Valley. Previously the journey was made by de-tour or over a 1 in 4 road through the bottom of the valley known locally as the Rhiw. The bridge is a part of the Sirhowy Enterprise Way, regeneration project and opened four months ahead of schedule on 3 December 2005. The bridge is a cable stayed bridge 230m long supported 30m above the valley floor by a 90m A frame pylon. Difficulties with mining related subsidence during construction and in the foreseeable future led the design team to allow the bridge to breathe if settlement does occur. The bridge and the Sirhowy Enterprise Way are owned and operated by Costain and Lang in a JV, under a 30-year DBFO (Design, Build, Finance, Operate) agreement. A statue to honour the Chartist struggle and their march to Newport has been erected on the East side of the bridge while a name plate is situated on the West. 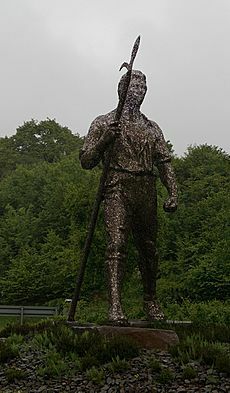 The statue itself is an impressive and imposing figure of a chartist striding forward, pike in hand. It is made up of thousands of brass rings and represents strength in unity. Blackwood Miners Institute is described by Caerphilly County Borough Council as the "Heart of the Community", from its inception in 1925 as Snooker Hall to its current Multi Entertainment Venue it sits at the heart of the town's event programme and is known locally as "The 'stute". In 1925 a Snooker Hall was opened, by the Coal Industry and the Social Welfare Organisation, and funded by the miners of Oakdale Colliery at the rate of 3d a week. The building was initially single-story but by 1936 another two floors had been added and by then the building had an auditorium, dance floor, reading room, library, ladies room and rehearsal rooms for local societies. Programmes from the time included Tea Dances, snooker/billiards, reading groups, rehearsals and union meetings for local miners. With the decline of the mining industry the building fell into disrepair throughout the 1970s and 1980s and ownership was handed to Islwyn Borough Council with the mandate to make it available for community use. The building was formally re-opened in February 1992 by Lynne Vaughan, who was Theatre Manager between September 1991 and June 1995. Funded by Islwyn Borough Council and the Welsh Office, it has given local dramatic societies the opportunity to perform on the same stage as Jasper Carrot, Ken Dodd and Welsh National Opera. The 1904-1905 Welsh Revival and the prominence of Christianity in the culture of Blackwood and the surrounding villages have left Blackwood with a high number of churches and chapels, although many are now disused, derilict and falling to ruin. Anglican churches include St. Margaret’s (Church in Wales), located at the top of the High Street. There is a Roman Catholic church, Sacred Heart, in nearby Pontllanfraith. The Church of Jesus Christ of Latter-day Saints, sometimes referred to as Mormons, have a history here. Organizations such as The Boys' Brigade and Girls' Brigade have prominence in Blackwood with companies meeting at the Baptist and Methodist churches, there are also a number of Christian youth groups. The position of Blackwood is mid valley between Risca the southern end of the Sirhowy River where the river merges with the Ebbw River which leads into the Severn Estuary at Newport. Until recently the main road through the town was the only road used by heavy haulage and cars alike. 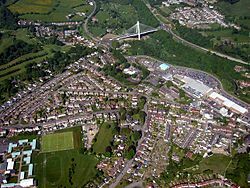 The Chartist Bridge has been built linking a number of well engineered single carriageway relief roads, meaning none of the journey from Blackwood to Newport now has to go through residential streets, all is on high quality new roads. The Pontypool journey no longer goes down the locally infamous 1 in 4 incline of the 'Rhiw' and now crosses the bridge and climbs up the other side of the valley on a steep but easily accessible road. There are no heavy or light train links in Blackwood, although Pengam railway station, on the Arriva Trains Wales route from Cardiff Central to Rhymney, is but a few minutes by bus. In addition there is a rail link service from Blackwood bus station to Ystrad Mynach train station which is a short journey away. Red & White, which covered the western Sirhowy valleys and Newport area. Red & White was started in post World War I, they served many areas of South Wales and Gloucestershire. After de-nationalisation the company was broken up, part became Stagecoach Red & White and the company is now known as Stagecoach South Wales. Western Welsh: a company nationalised in 1969. Red & White and Western Welsh merged to become National Welsh in 1978, which was privatised in 1987. Its operations were acquired by Stagecoach in South Wales in 1992. IBT - Islwyn Borough Transport: IBT (originally established in 1926 as the West Monmouthshore Omnibus Board) was the former municipal operator and served routes in the traditional Islwyn Borough Area (Bedwellty and Mynyddislwyn) with the main depot next to St Margaret's Church, Blackwood. Later moving to a new depot on Penmaen Road Pontllanfraith; a depot that is still occupied by IBT's successor organisation. Following deregulation, its IBT traded as an arms' length operation of Caerphilly County Borough Council. Its distinctive blue and white livery was transferred from its Leyland Tiger and Leyland Leopard buses (which were a common sight until the early 21st Century) to their low floor fleet. However, in late 2009 Caerphilly resolved to sell IBT to Stagecoach in South Wales. The sale was approved by the Office of Fair Trading and took place on 12 January 2010. Harris Coaches: Formerly a coach operator moved into bus operation after deregulation. Glyn Williams: Glyn Williams was the first company in the area to move large scale into low floor buses, they eventually sold out to Stagecoach in 2005. The Rotary Club of Blackwood was formed in 1946 and currently has seventeen male and two female members. The Club meets every Tuesday at Maes Manor Hotel and is active in the local community. The Club raises funds for various charities and supports extra curricular activities in local schools. Every Christmas, club members can be found at the entrance to the town's Asda store, with a miniature nativity scene, raising funds that the Club donates to local charities. On 6 December 2012 the Club hosted the Welsh premiere of the Dustin Hoffman film Quartet. The venue for this premiere was Cardiff's Cineworld complex, with an after film party at a Cardiff hotel. In early August 2014 Blackwood's Maxime cinema reopened its doors after being purchased by new owners and after being given an extensive refit. On 5 August the Rotary Club of Blackwood hosted the cinema's gala opening evening. The film chosen for this event was the aptly named Blackwood, a 2014 ghost story from an independent production company. The showing was attended by almost two hundred paying guests with an after film party held at the Maes Manor Hotel. The event raised several thousand pounds. The Club is committed to using all money raised, at this event, for the benefit of local charities and voluntary organisations. The Club's current president is Adrian Stevens, a Blackwood garage proprietor. Blackwood is currently represented on Caerphilly County Borough Council by one Labour Party councillor Pat Cook and two Independent councillors Allan Rees and Nigel Dix. Blackwood, Caerphilly Facts for Kids. Kiddle Encyclopedia.